When we first got Spot the Cat I wasn’t working. I think I was home for a few months. But when we first got her I still didn’t want to get her a big scratching, lounging type of tower. I couldn’t decide on a tower and I thought it was a good idea to change up her play structures. I thought that having large sturdy boxes that we could change was better for her to play in. I thought it would help her from getting bored. When we first got her my husband worked at a company where there was often surplus boxes around. He worked at a box company so sometimes the mock-up box created for a client would go unused. About once every three or four months either he would bring home a box or we would use one that we had something delivered in. He and I took turns cutting the box. We would cut “doors” and holes in it so she could jump in and out of it or crawl around. It is amazing how much fun cats have in boxes. Eventually we got a tower, but when we had access to a big sturdy box we use it, too. We do the same thing with our two cats now. Boxes and packing paper seem to be items that bring endless hours of entertainment and/or help bring the interest back in a toy. A while back we got something in a big sturdy box. My husband cut the doors and holes in it and we gave to the cats. They love it. I have made my husband suffer through keeping the box. I move it out into the garage (and this is where the suffering comes in because it gets in our way) every once in a while, taking it away from the cats. I keep it out there for a month or so, then I bring it back in. I think this one, I had it out there for a long time this last time I took it out because my husband threatened to throw it away quite a few times. When I brought it back in the house it was totally worth all of our “suffering”. Our cats, especially Nessa when crazy over it. They rubbed all over it and jumped in it. Nessa was ALWAYS in it. They love their box. It works well because Nessa is such a tiny light cat, she can jump up on it. Teagan can be on it, but she is not as much of a jumper as Nessa. The chase each other in and out of it. We use the fliers to have them play in the box. They love it. Christmas is coming so the house gets crowded with the tree so the box will be going out again soon. It will be out for a few months then come back in. But the packing paper will probably stay for a while. We use that to entertain the cats too. It comes and goes. So many things come packed in packing paper we always have some around. The cats love that too. Teagan will NOT tolerate a flier being under the paper. Or anything for that matter. She can be sound asleep and if you put a toy under the paper she will jump up and pounce on it. She is hilarious when it comes to something under the paper. Nessa likes to play with toys and the paper, too. It is really as if the toy is brand new. Two easy ways to bring life back into a neglected toy – use it with a box or packing paper. Also easy and simple ways to give something to the cats to play with. The box alone and the paper alone provide entertainment. Add a toy to it and there ya go. 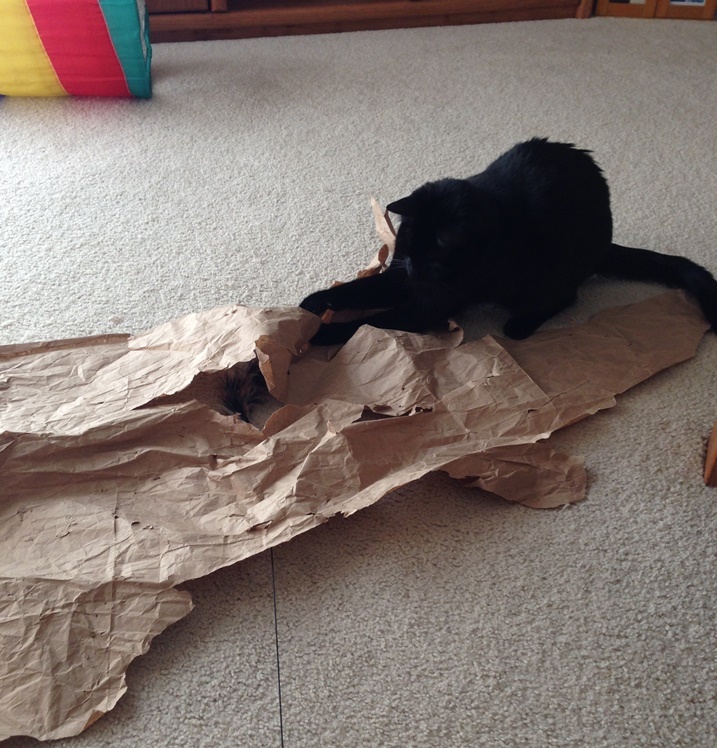 Does your cat love packing paper? 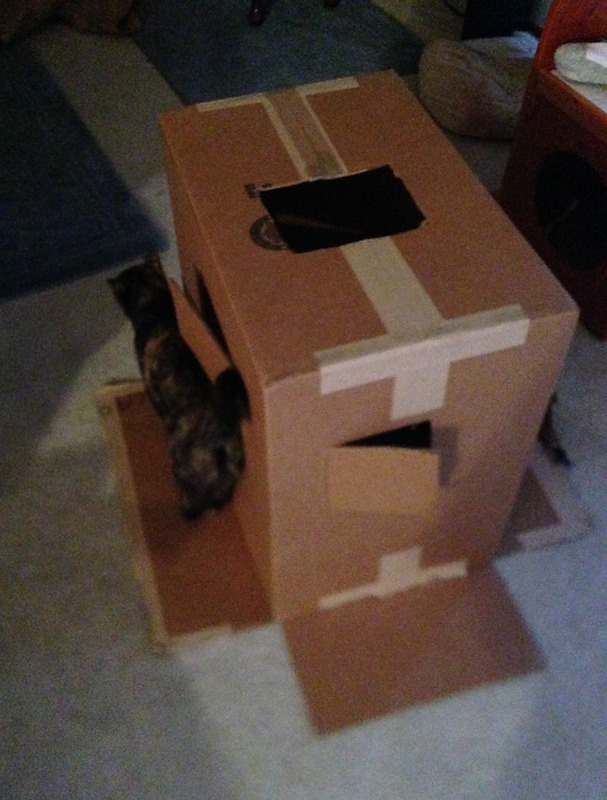 Do your cats love to play in forts made of boxes? 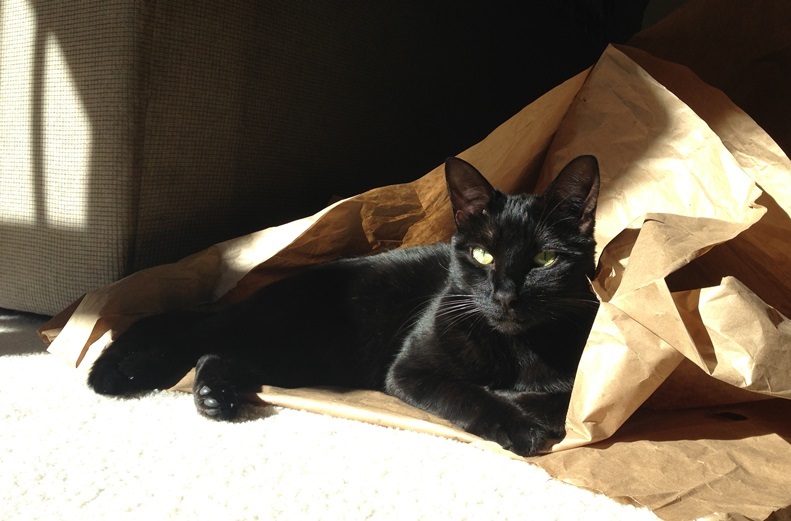 Do your cats get hours of entertainment out of packaging?